Gov. 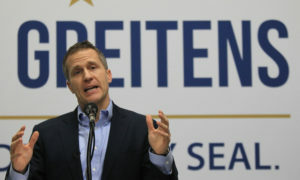 Eric Greitens (R) is proposing that $52 million from a legal settlement with tobacco companies be factored into his 2018 budget recommendations. It would be used to partially restore funding to home health care for the disabled and elderly as well as K-12 bus transportation. The money is part of a series of payments from four major tobacco companies to 46 different states as part of the Tobacco Master Settlement Agreement. It was originally intended to pay for tobacco-related public health costs. In 2014, Missouri missed out on half of the $130 million payment after an arbitration panel ruled that the state did not meet its end of the agreement in 2003. The Missouri Supreme Court ruled last week that the state was entitled to at least part of the roughly $70 million the state missed out on in 2014. While it is still unclear if the state will receive the full $52 million, Gov. Greitens is amending his budget proposal to factor in the amount. In a Facebook post, he describes the move as a “short-term fix”. Home and community based services, which provides in-home healthcare for the disabled and elderly, would have $41 million restored to its budget if the full settlement is paid out and if the legislature agrees with the governor’s request. Originally, the governor’s FY2018 budget proposal called for $52 million in cuts. K-12 bus transportation would have $11 million restored after the original budget called for around $35 million to be pulled. House Minority Floor Leader Gail McCann Beatty (D-Kansas City) says Greitens’ plan is a start, but that it might be too soon to assume how much money the state will actually get. Beatty says the governor can amend his budget as he pleases, but that the ultimate decision lies with the legislature. House Budget Committee Chairman Scott Fitzpatrick (R-Shell Knob) says getting the settlement money back is a temporary fix. The budget committee is facing a similar issue with the loss of extra federal funding for the Children’s Health Insurance Program. Fitzpatrick would not say whether or not he would abide by the governor’s budget recommendations, but says as a rule it is best to fund recurring expenses with consistent revenue.